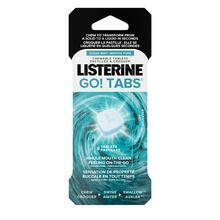 LISTERINE TOTAL CARE® Antiseptic Mouthwash is rated 4.8 out of 5 by 49. Use after brushing teeth with toothpaste. Adults and children 12 years and older: Rinse full strength with 20 mL for 30 seconds twice a day. DO NOT SWALLOW. Do not eat or drink for 30 minutes after use. Rated 4 out of 5 by Macy55 from Listerine Total is the Best Both my husband and I are over 50 so in our household we only use Listerine Total Sensitive. It really makes a difference in our mouths. Rated 5 out of 5 by Rodwings from The Best In my opinion, there are no better oral care mouthwashes out there! Rated 5 out of 5 by addam from Excellent This is exactly what I need in a mouth wash. Clean and refreshing, and it helps keep my breath fresh much longer than others I've used. Rated 5 out of 5 by travellingcanadian from great product! When I was living in New Zealand I ended up buying a small bottle and trying it out and loved it. 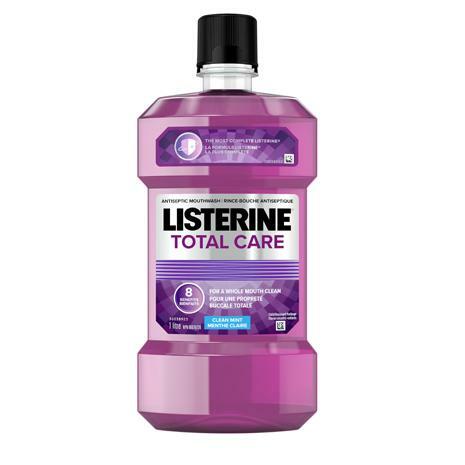 Once I got home I started to be more aware of my mouth hygiene and bought a big bottle of the Listerine Total Care and did the 2 week Listerine challenge. Within 3 days I already noticed a difference with my teeth as well as my gums. I've been super happy with this product and rave about it to all my friends. Its definitely on the grocery list now when I'm running low! Rated 4 out of 5 by Anonymous from Great I just my semi-annual dental check up and my dentist commented on how little plaque had accumulated on my teeth. I told him I was using Listerine Total Care. Rated 5 out of 5 by KarenW from Listerine, a morning ritual I won't ever give up. 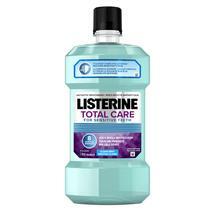 I have been using Listerine Total Care for about a year now, I just like it better than the other "total" care rinses! It makes my entire mouth feel clean and fresh. Not to powerful but powerful enough to make your mouth want to dance. :-) I would and do recommend this product. Thanks for making it, not sure what I'd do without it. Rated 5 out of 5 by Jenelisabeth from Great Product! This product works great. Once I started using it I noticed a difference right away. I found that I wasn't getting bad breath during the day and less plaque was building up on my teeth. I also noticed that my gums were less inflamed. I like that there isn't a noticeable alcohol taste to the Listerine Total Care Mouthwash. I will definitely continue to use this product and recommend it to anyone who asks. Rated 5 out of 5 by pennyoh from This product changed my oral health Using this product over the last two weeks has greatly improved my oral health. I will continue to use this product daily.